This drill emphasizes the transition game (see Transition Offense, Transition Defense), both offensive and defensive skills. Setup: (red is offense, blue is defense, yellow is the coach with the ball). The four offensive players line up on the end line, while the four defensive players line up at the level of the free throw line. 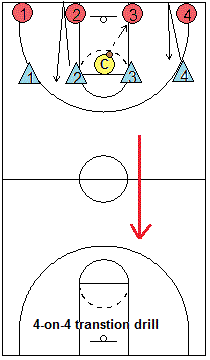 The coach has the ball and simultaneously yells the names of two of the defensive players (in this diagram, #'s 2 and 4) and throws the ball to the offense. The offense immediately tries to get the fast break going. The defense tries to stop the break. In order to give the offense a head start, the two defensive players whose names the coach called out, have to first go touch the end line, and then sprint back to help on defense. The offense tries to score. If the defense steals the ball or gets the rebound, or gets possession after a made basket, they quickly push the ball back up the floor for their own fast break and score. Once they score, or are stopped, the ball goes back to the coach, the players line up again, and it starts all over again, but this time with the blue team on the end line, and the red team defending.